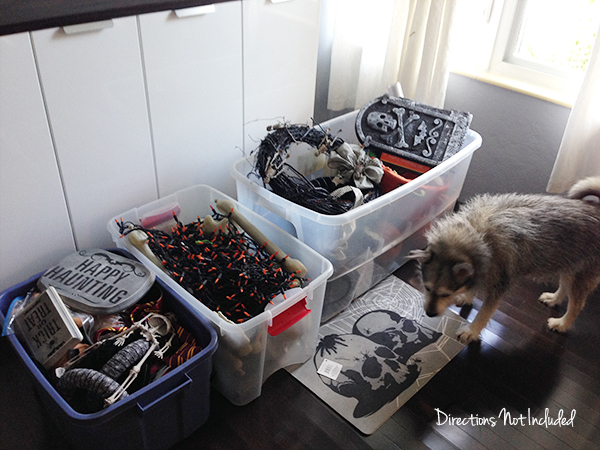 DIY and craft adventures of two humans, three dogs and two cats. It’s almost here! This is the time of the year that I start singing The Nightmare Before Christmas’ “This is Halloween” over and over. Planning for Halloween is definitely one of the highlights of my year. I actually went all out last year for Halloween, but I wasn’t blogging much and even though we had an epic Halloween party, I took no photos with my camera. Bad Anna. This year, I’m starting early with a new series, appropriately titled “This is Halloween”. 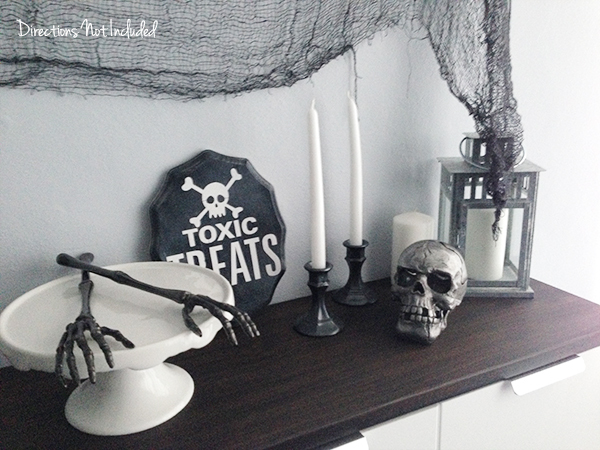 I’ll have a new Halloween craft or decor every week until Halloween and will be kicking off my first first link party for all things Halloween related! More on that soon, but in the meantime, I thought I would share the few tidbits from Halloween last year that I managed to get on my phone. Even Dylan was judging me for taking down the Halloween decor in September. 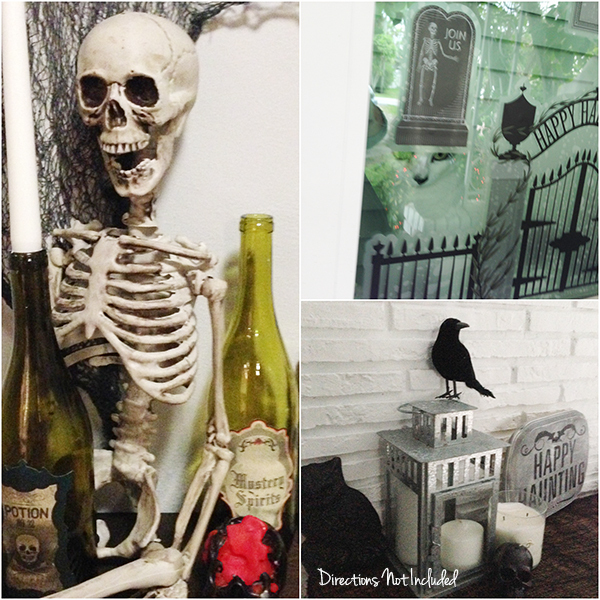 I ended up putting up all the outside decor the last week of September. This year my neighbors are going to just have to deal with the decorations going up in mid-September. I’m having surgery on my foot at the end of September and won’t be up and about until way into October. These storage containers don’t even show the half of it. I made out like a bandit during Target’s after Halloween sale so besides this stash, there is more brand new stuff, plus everything I have been making. The first step is admitting you have a problem, right? We threw a going away/Halloween party last year for our dear friends who moved away (but thankfully moved back this month!). I took that as a challenge to get the house as decked out as much as possible without spending a ton of cash. I LOVE those 40% off coupons from Michael’s and buying items you can repurpose from the dollar stores. 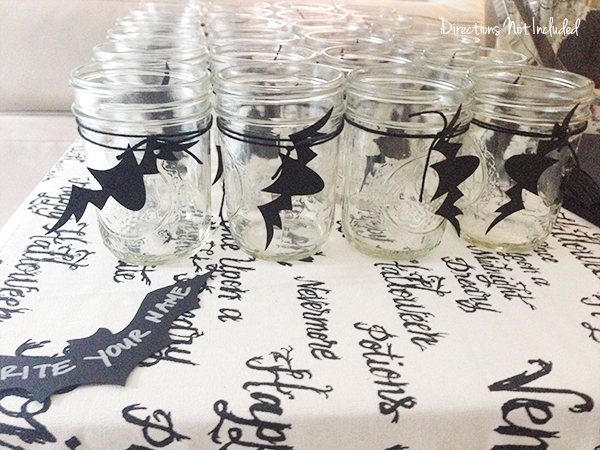 I have a massive amount of small mason jars I use for bridal and baby showers I throw, but they came in handy for Halloween too. I used my Silhouette to cut out bats to serve as name tags on everyone’s glass for our party. We don’t have a mantel so my IKEA Hack Bar always ends up as one. I had better pictures of this. I ended up covering the wall with paper bats and my dining room table has a beautiful food display the night of the party. I’ll make it even better this year. Promise. I’m going to kick off the This is Halloween link party in September since I am pretty sure I’m the only lunatic already crafting for Halloween. In the meantime, stick around to see what I’m working out on to make this Halloween and our party top last year’s. The holiday season has officially begun! Are you ready? Eek! It will be Christmas before we know it!! Pssst – If you don’t already follow me on Pinterest, this is the time to do it! Lots of holiday inspiration coming. 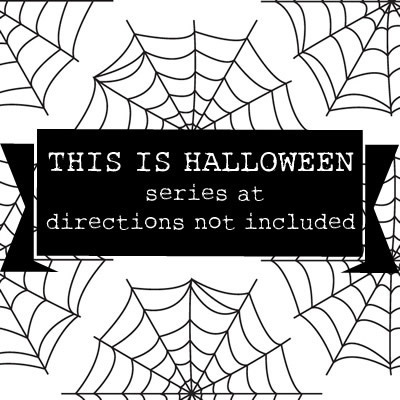 Follow Anna [DirectionsNotIncluded]‘s board this is halloween on Pinterest. Hi there! I'm Anna, the voice behind Directions Not Included. 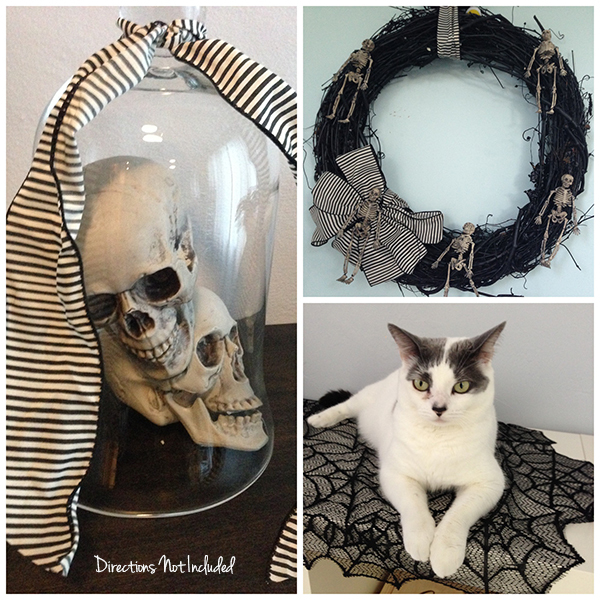 I'm a marketer, crafter, DIYer and lover of all things home related. You can usually find me covered in paint, cuddled with one of my pets or in front of a computer or other digital device. Thanks for reading Directions Not Included. I hope you stick around. AKA this is awesome. halloween rocks! I can’t wait to see the HP party and your Halloween stuff! I have a project in the works inspired by you!! LOVE -LOVE- LOVE this. Glad to see someone else getting ready for Halloween already. Cant wait to see what you are working on. Thanks Donetta! I’m super excited! Welcome to Directions Not Included. 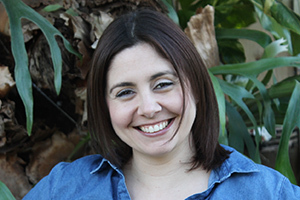 I'm Anna, the voice behind the blog. I'm a marketer, crafter, DIYer, and lover of wine and sushi. Oh and I love my husband Ray, too. I also seem to be a magnet for scruffy mutts and cats. Want to know more about us and what we are doing? Learn more here. Visit Anna [DirectionsNotIncluded]'s profile on Pinterest. Directions Not Included follows the DIY and craft adventures of two humans, three dogs and two cats as they take one old Florida home and make it theirs. This blog will feature DIY tips, before and after photos, craft tutorials, home decor trends, and gratuitous pictures of our five rescued furry children. Copyright 2010 - 2014. Directions Not Included - Anna Cruz-Morales. The contents of this blog, including text, original photos and ideas are the sole property of the author. If you intend to use my text or images, please link back to my site and credit given to Directions Not Included. Please share only one image and direct readers to my site. A notification email would be greatly appreciated.